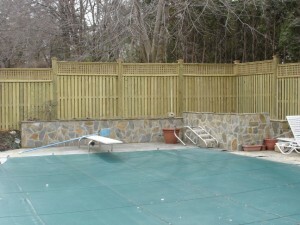 What Species of Wood is Best for a New Wood Fence in Richmond? So you’re set on a new fence, but you’re not sure which species of wood you want to use? There are a number of different species used for wood fencing, each with their own pros and cons. Learn about some of the more common wood species and their defining characteristics in this week’s blog. Don’t get a wood fence in Richmond before finding the wood species that’s best for you! Southern yellow pine is a very affordable choice. You can expect to pay around $4 per linear foot for this species of fencing. However, it’s not as naturally resistant to rot and insects, and needs to be treated to remove sap. It is also a more knotty wood. Douglas Fir is strong and has no sap. It’s more resistant to rot than Southern Yellow Pine, but not quite as resistant as red cedar or redwood. You can expect to pay around $30 per linear foot for this species for your new wood fence. If you can afford the price, Redwood is an excellent choice. You can pay up to $40 per linear foot for Redwood, but it’s very durable and resistant to the elements. It is also sap free. A solid mid-range wood, Eastern White Cedar has no sap and has small knots. You can pay around $27 per linear foot for this species. Cypress grows in swamps in the southern U.S. and is actually related to redwood, but has a much more affordable price at around $17 per linear foot. Small, tight knots and no-sap. A great all-around wood species. Very resistant to rot and insects, no sap, and a price of around $6 per linear foot. Whitewood is not actually one species of wood, but rather used to refer collectively to a number of species that are not great for fencing such as spruce and pine. If it isn’t treated, you can expect whitewood to last only half as long as naturally rot resistant wood species. It’s best to avoid whitewood and opt for a longer-lasting wood species. This entry was posted on Friday, January 30th, 2015 at 5:13 pm. Both comments and pings are currently closed.